Hi Friends: There is a new challenge today over at the Stinkin' Inkers Challenges Blog, where the current theme is Showers of Flowers. When I first heard this theme, it screamed shaker card to me, so my creation for this week is a shower shaker card. For me, it's really CAS - I decided to let the shaker take the stage! I hope that you are inspired by my creation and will join us over at the Stinkin' Inkers Challenges Blog to see the creations of the other design team members and enter this fun challenge! Thanks for stopping by and have a great Inky day! Stamp girl with umbrella image onto white cardstock with black ink. Randomly stamp floral fall image onto background using Picked Raspberry and Peacock Feathers Distress Inks (to match the patterned papers.) Cut focal image into rectangle and cut piece of clear transparency to cover. 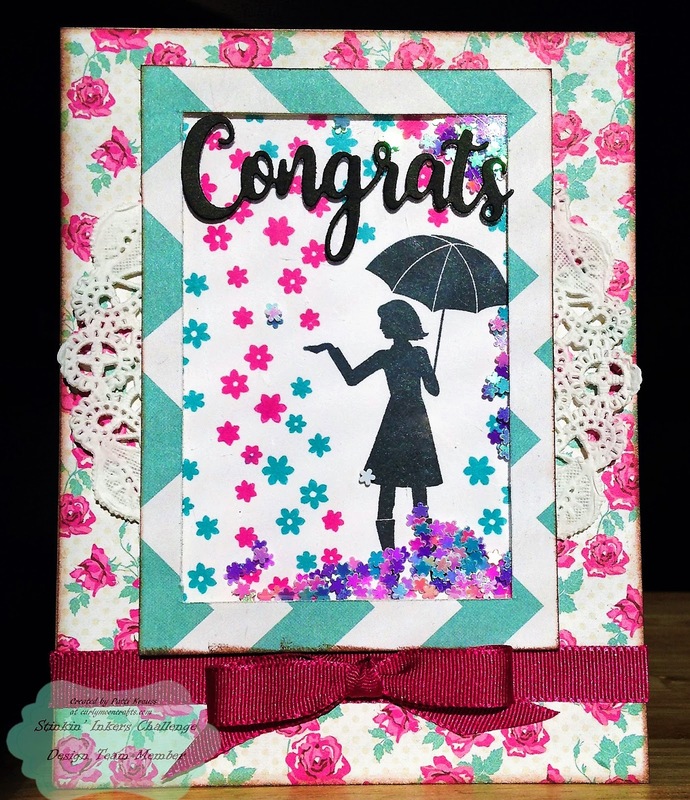 Create frame from the patterned paper, ink edges, and glue transparency to the frame. Add foam tape to frame, then add tiny flower sequins to the frame/transparency. Add stamped panel to create the shaker. Assemble card: Cut patterned paper to fit A2 card base, ink edges, and glue to card front. Add doily to center of card, then place shaker focal image over doily. Add ribbon and bow below shaker. Cut sentiment from black cardstock using die and glue to top of shaker. Shake away to create the lovely shower of flowers! I like it. Beautiful. Love the colors.